Introduction Laboratory is a place where ideas and concepts can be tested through experiments. Biology, like any other discipline of science, is based on experimental work and therefore practical forms an integral part of learning. Biology laboratory provides a unique learning environment where learners inculcate scientific temper, develop relevant skills and get exposed to realms of techniques and methodologies of scientific investigations. Laboratory investigations in biology increase reasoning abilities, bring scientific attitude in a learner and also help in acquisition of skills of scientific processes. Also, observation of nature and the living organisms found in it is no less important for the understanding of many aspects of the subject, especially the diversity of the living organisms, their systematic study, their relationships among themselves and with the environment. Knowledge in the field of biology can be acquired or constructed only on the basis of correct observations and experimentally verifiable processes. Biology laboratory, thus, provides the learners an environment where the process of learning is facilitated by hands on experiments. Biology is a unique discipline in the sense that it does not merely deal with the study of morphology, anatomy, physiology and reproduction of the living organisms; rather, understanding of the subject requires understanding of a number of interdisciplinary areas and approaches. On one hand, a biologist needs to be sufficiently skilled in handling the enormous diversity of the living organisms, be it plants, animals, fungi or even microscopic bacteria, while on the other hand, a biologist should be able to understand the biochemical, molecular, physiological, behavioural, genetic and many other phenomena pertaining to the living organisms. The study of intricate relationship of different types of organisms among themselves and also with its environment is an important concern of a biologist. Thus, experiments and exercises in biology train a learner about skills of observations, manipulation of the organisms for the study of internal details, biochemical as well as molecular composition and processes, investigation of the abiotic environment and even analysis of phenomena like inheritance and evolution. As far as the study of the living organism is concerned, correctness of the method is very important. Such a study may be very simple, e.g., study of habit, habitat and external features of the plants or animals, or, it may involve certain manipulations like dissection and section cutting of the parts of the organisms to study the minute details. Very often observation and study of the magnified image of the minute parts under a microscope provides a better insight about the features of the organisms. However, microscopic study involves certain specific skills depending on the type of the organisms/tissues/cells to be studied. It involves specific preparations (peeling, section cutting, fixation, staining, dehydration, mounting, etc.) so Laboratory Manual: Biology that microscopic examination reveals the expected details. As histological and cytological observations give us only static pictures of the continuous processes, analysis of biochemical, physiological and ecological aspects need certain other kind of skills such as preparation of chemicals and reagents, designing and performing an experiment, observation and recording of data and ultimately interpretation and drawing conclusions. While performing experiments, honesty in recording of data and its correct presentation is very important as it not only useful in the logical interpretation but also helps in the identification of errors. In order to perform experiments successfully, a learner needs to go to the biology laboratory, well prepared. This includes the following: 1. Laboratory Record Book: For maintaining all the information, including recording of data and its interpretation. 2. Dissection Box: A dissection box is required in the biology laboratory for various purposes like handling and manipulation of living materials, performing experiments, preparation of slides etc. A dissection box should contain scissors (two pairs, one small with fine tip and one larger), scalpels (one small and one medium sized), forceps (two, one small with sharp fine tips and the other medium sized with blunt tips), dissecting needles (two), razor, hand lens, dropper, fine brush, etc. 3. Laboratory Manual 4. A Laboratory Coat or Apron 5. A Hand Towel While in the laboratory, student should be very careful and methodical. One should listen carefully to the instructions given by the teacher/instructor before performing an experiment. In the biology laboratory a student has to handle a number of sharp objects and hence, necessary precaution and care should always be taken while handling objects like scissors, forceps, needles, scalpel, razor etc. It is also very important to follow the safety instructions mentioned on the instruments and/or on the label of the reagent/chemical. Student should also be aware about the use of the First aid Box so that in case of any accident or injury the preliminary aid can be provided to the affected person. While describing the experiment students are expected to follow a pattern in which the aim of the experiment, its principle, list of the materials to be used, procedure, observation table (if required), inference and discussion should be given. Necessary precautions to be taken should also be mentioned appropriately in the procedure or at the end. There are a few experiments in which field visit is essentially required. All the necessary preparations (materials, equipments, reagents and chemicals) should be made in advance. Drawing of illustrations is also an important component of the practical in Biology. Students are expected to follow certain Introduction fundamental rules while drawing the illustrations so that it reflects one’s observations correctly. • Make illustrations using pencil only and always use white drawing sheet. Illustration should be in the centre of the page. • Drawing of an object (plant, animal or experimental set-up) should be proportionate in size. • Draw illustrations keeping the object in front. • Drawing must be clear with simple outlines. • Appropriately label drawings. Parts of the drawing should be indicated by straight horizontal line or arrow. Two lines or arrow should never cross each other. As far as possible, labeling should be done on the right side of the drawing. An appropriate legend or heading of the drawing should also be given below it. 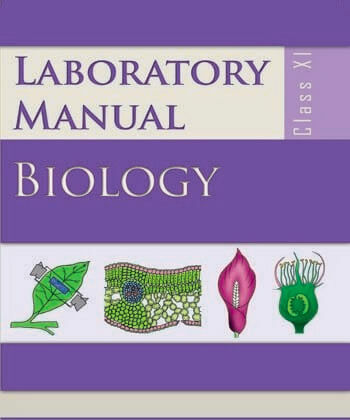 About the Manual The main objective of the manual is to introduce the students of higher secondary stage to the fascinating world of plants, animals and microbes and their complex biological phenomena. The manual covers a complete description of the experiments and exercises. The suggested experiments cover almost all the units/topics including those on diversity in living world, plant, animal and human physiology, genetics, biotechnology and human welfare and environment. A standard format has been used to describe each experiment which includes: • Aim: It gives a brief title of the experiment under investigation. • Principle: It is a very brief introduction of the experiment under investigation and explains the biological phenomenon involved. It gives a brief but comprehensive idea about the design of the experiment and explains the significance of the phenomenon being studied. • Material required:Includes the names of plants/animals to be used as 'samples'; the type of apparatus; the type and quantity of glass-wares required; reagents, chemicals and solutions needed, their concentration and other specification, methods of preparation of solutions and reagents. If a particular material/chemical/glassware is not available sufficient alternatives have been suggested. • Procedure: This section includes full details of experimental procedure explained stepwise, including special precautions necessary to be taken while the experiment is being conducted. Drawings of the samples, apparatus and the experimental setup, wherever, found necessary have been included to facilitate the students to perform the experiment as accurately as possible. • Observation and Result: This section deals with the recording of all observations made during the experiment. Students are advised to consider the entire data. Data can be represented in the form of tables, Laboratory Manual: Biology graphs and histograms wherever possible. Use of units in which various quantities are measured has been indicated in the manual. • Discussion: Included in this heading is a statement of the conclusions drawn from the experimental results and compared thesis (wherever possible) with any comparable data from other sources. The relevance of the conclusions drawn from the experimental results to the various processes under investigation and to the life of plant, animal and microbes has been prompted out. • Precaution: This section contains all the necessary precautions to be taken during experimentation to obtain results free of errors. However, attempts have been made to mention required precautions along with the procedure also. A great emphasis has been laid on a student getting valid results and interpreting them. It is essential that the teacher should properly explain each experiment so that inexperienced students will be able to obtain accurate results within a reasonable time. Teachers are also expected to help students in identifying errors and mistakes committed during experiments and ways for correcting them. It is possible that some of the students may undoubtedly be capable of doing more sophisticated work than that represented in the manual. But introductory course of this sort has been designed to help all students for some useful and joyful experience by conducting the experiments of their own. Exercise 1 Aim: To study parts of a compound microscope. Principle: Magnified and real images of minute objects are obtained using combination of lenses. A compound microscope is a complex assemblage of such lenses enabling highly magnified images of the microscopic living organisms and intricate details of cells and tissues. A monocular mono-objective compound microscope is normally used in a biology laboratory. Requirement: A compound microscope, silk cloth, lens cleaning fluid and lens cleaning paper. Place the microscope on the working table and remove dust by wiping the body with a silk cloth. Clean the lenses with lens cleaning fluid and lens cleaning paper. Identify the various parts of the microscope (Fig. 1.1). Draw a diagram of the microscope and label its various parts. Take a permanent slide preparation or a temporary preparation made by you, keep it on the stage, fix with clips after focusing and view. Learn how the microscope can be tilted or inclined by moving the arm of the microscope. Note, how focussing is done by moving the coarse adjustment and fine adjustment knobs. (i) The microscope has a strong basal foot and a vertical arm joined by an inclination joint. The arm can be tilted to different angles for its convenient usage. (ii) The stage of the microscope is round/rectangular/square shaped and is fixed to the arm. In the centre of the stage is a small circular hole covered with glass for passage of light. (iii) The stage is provided with two clips or mechanical device to fix and hold the slide firmly in position. The material to be observed is brought into view by moving the slide and then fixed with the help of clips at desired position. (iv) A movable (rack and pinion mechanism) or a fixed substage is provided with an iris diaphragm and condensor. The condensor is a system of two or more lenses to recieve parallel light rays and to converge these Laboratory Manual: Biology Eye piece Coarse adjustment knob Fine adjustment knob Hole StageClip Iris diaphragm & condensor Vertical arm Mirror Inclination joint Basal Foot on to the object through the iris and the hole present in the stage. The diaphragm helps in regulating the aperture size and thereby controls the amount of light that passes through the slide (Fig. 1.2). The needle/ pin is used to increase or decrease the aperture size. Some microscopes do not have the condensor. Fig.1.2 Iris diaphragm showing different aperture sizes (v) An adjustable mirror is fitted below the condensor. It has plano- concave surfaces to focus the converging rays of light on the object through iris diaphragm and condensor in order to obtain a brightly illuminated image of the object. (vi) The body of the microscope consists of a movable tubular body tube raised on rack and pinion mechanism. The tube has an ocular or eye piece of specific magnification (which can be changed for lower or higher magnification, i.e., 5X, 10X or 15X. Eye piece with pointer are also available. Two objective lenses 10X, 40X or 45X are mounted on a revolving nose piece at the lower end. Exercise 1 Some microscopes may also have a third objective lens (100X) called oil immersion lens. The tube with eye and objective lenses can be moved up or down to focus the object sharply with the help of coarse adjustment knob and fine adjustment knob. The object is first viewed under lower magnification using the coarse adjustment and then under higher magnification by rotating the revolving nose piece on which the objective lenses are mounted. While viewing at higher magnification, only fine adjustment knob is used for fine focus tuning. Magnification by a microscope is a multiple of the X value of the lenses of the eye piece and objective. For example, a 5X eye piece and a 40X objective will magnify the image 5 × 40 = 200 times the size of the object. Similarly, when a 10X eye piece and a 40X objective are used, magnifying power would be 10 × 40 = 400X. Generally, in a compound microscope, the eye piece lenses are 10X or 15X and the objective lenses are 10X as well as 40X. (i) Always clean the lenses before and after using the microscope. (ii) For cleaning lenses, always use lens cleaning fluid and lens cleaning paper. (iii) While observing, the objective lens should be carefully adjusted so as to avoid touching the slide lest it breaks the slide. (iv) Always put back the microscope in its case after use. Questions 1. What is the magnification achieved when a 15X eye piece and a 40X objective are used together ? 2. What would happen if direct sun rays are focused by the mirror into the body tube? 3. What is the difference between a dissecting and a compound microscope? 4. Which of the following parts provides support and supports the weight of a microscope? (a) Arm (b) Stage (c) Body tube (d) Foot 5. To which part of a microscope is the objectives fitted. (a) Nose piece (b) Diaphragm (c) Stage (d) Arm 6. Magnification power of a microscope is calculated by (a)magnifying power of eye piece × magnifying power of mirror. (b)magnifying power of eye piece × magnifying power of objective. (c)magnifying power of objective × magnifying power of plane mirror.